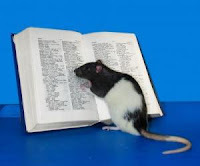 Smart rat Hobbie-J was named after a character in a Chinese cartoon book. (Credit: Medical College of Georgia). Over-expressing a gene that lets brain cells communicate just a fraction of a second longer makes a smarter rat, report researchers from the Medical College of Georgia and East China Normal University.